Recovering from chronic illness can be a gruelling and lengthy procedure which is draining on physical and emotional levels. Looking your best can help you feel better and vice versa. Using cosmetics and natural personal care products can not only help you look and feel better, but they can also help speed up the healing and recovery process. Over the past 30 years, several centres for beauty and camouflage have been opened in British hospitals. The aim of these centres is to provide psychological help to patients when their treatment has led to a lessening of well-being, often accompanied by a certain loss of identity and self-esteem. Experiments have shown that positive changes of mood follow the application of make-up or exposure to a pleasant fragrance. This was observed by measuring the rate of "markers" for the body's immune system. Prolonged illness can leave your skin looking tired and listless but there are cosmetic techniques you can use to combat this that will leave you looking and feeling better. The number one give away for tiredness is dark circles under the eyes. There is a wide range of concealers available. Another sign of prolonged illness is pallid, pasty looking skin. If you don't have the time or the money to take a few weeks off to the Bahamas, you may want to try one of the wonderful new fake tanning products on the market. Fake tans have advanced to the point where they look completely natural. You have lots of options. You can have a dark tan or a gentle tan- if it's your first time then a gradual, gentle tan might be better for you. There are also different methods of application including rub on roll-on or spray on, you can even have it airbrushed on commercially. Before you apply your tan always exfoliate your skin to remove dead cells and leave the surface of your skin smooth. Focus particularly on drier areas such as elbows and knees. This will prevent the pigments from concentrating in these spots. Moisturising well will also ensure an even tan. Use a slow even pressure when you are applying the tanning product and don't forget you'll still need to wear sunscreen when you go outdoors. Sometimes nothing can be more invigorating than a soak in the tub, especially if you have the right blend of salts and essences to soften and scent your water. 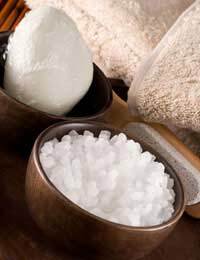 All natural therapeutic blends of dead sea salt and Epsom salt help to re-mineralize your over-fatigued body. Brands that contain essential oils of peppermint, geranium and sage can stimulates the mind, balance your body and help to stimulate a weakened immune system. Natural algae and seaweed rich bath gels can also be a big boost to a recovering system. Seaweed is one of nature's body balancers. Not only is seaweed bath an excellent way to take in iodine, (which is great for the thyroid gland), it releases toxins from your system and rehydrates your body. A green tea bath can be a great healer, particularly if you have been ill in bed for a long period of time because green tea can help sooth and heal bedsores.